Chennai based Geographical Indication Registry and Intellectual Property India has granted Alphonso Mango from 5 districts of Maharashtra- Geographical Indication (GI) tag. These five districts Ratnagiri, Sindhudurg, Palghar, Thane and Raigad are from western Konkan coastal region of the State. With this recognition, Alphonso has joined the list of 325 products from India with GI tag. Alphonso, better known as 'Hapus' in Maharashtra is considered as the king of mangoes. It is best known for its taste and also for pleasant fragrance and vibrant colour. It is in demand in domestic and international markets. It has long been one of world's most popular fruits and is exported to various countries including Japan, Korea, Europe, US and Australia. GI is an indication used on products that have a specific geographical origin and possess qualities or a reputation that are due to that origin. It is primarily given to agricultural, natural and manufactured goods having special quality and established reputation. It comes under Ministry of Commerce and Industry. The first GI in India was given to Darjeeling tea in 2004. 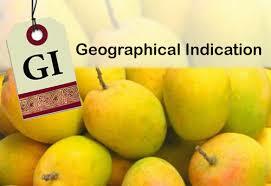 Tirupathi Laddu, Kangra Paintings, Nagpur Orange and Kashmir Pashmina are among registered GIs in India. Karnataka tops with 38 GI products, followed by Maharashtra which has 33 GI products. Q. Chennai based Geographical Indication Registry and Intellectual Property India has granted which fruit from 5 districts of Maharashtra- Geographical Indication (GI) tag?